Finally, I got your best video in HD quality also with another type of genre music, hip hop. Oh man,,, you done well. It’s more different, more creative, more show another you. Who doesn’t know this man ? 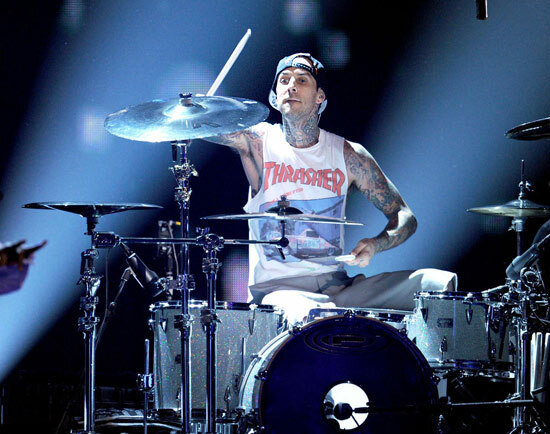 Travis Landon Barker (born November 14, 1975) is an American musician, producer and entrepreneur, most noted as the drummer for the American pop punk band Blink-182, as well as the alternative rock band +44, the rap rock band The Transplants, and the alternative rock band Box Car Racer. He was a frequent collaborator with the late DJ AM, and together they formed TRV$DJAM. He also went on tour with Quest in 2007. he also made 3 albums with Quest, KSLIP, Why not?, and their most recent one Genius. After the split of his first band, Feeble, Barker began playing for The Aquabats in 1996 as The Baron Von Tito. He recorded one album with them, The Fury of The Aquabats!, in 1997. His career took off when he joined up with pop punk band Blink-182 in 1998. Barker has since established himself as a versatile drummer, producing and making guest appearances in music projects of numerous music genres including hip hop, alternative rock, pop and country. He has gained significant acceptance within the hip-hop community in particular and often collaborates with artists to compose rock-tinged remixes to their songs. He founded clothing company Famous Stars and Straps in 1999 and LaSalle Records in 2004. Companies such as DC Shoes and Zildjian cymbals have co-designed products in his name. Barker collaborated with artists (including Game, Tom Morello, Corey Taylor, Slaughterhouse, Raekwon, RZA, Slash, and other musicians) for his solo debut album, Give the Drummer Some, which was released on March 15, 2011. P.S : please watch in positively eyes. ~ by keishinta on October 16, 2011.